Please refer to our stock # 40E96 119 when inquiring. Alexander Wilson (Scottish/American, 1766-1813), Plate 71, from his "American Ornithology", published by Bradford & Innskeep, Philadelphia. 1808-1814. 1st edition. Engraved by Alexander Lawson. 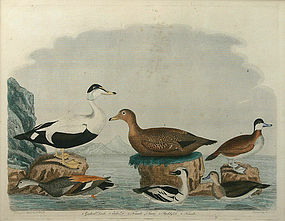 This hand colored, engraving depicts six species: gadwal duck, eider duck, female eider, smew, ruddy duck, and female ruddy. Plate size: 10.25" x 13.25". Condition: some light foxing. Alexander Wilson, a Scottish emigrant, has been referred to as the "Father of American Ornithology", and his treatise, "American Ornithology," first published between 1808-1814, predated J.J. Audubon by about two decades. In it he depicted 262 species of birds, including 39 previously unknown varieties. The nine volumes contained his descriptions of each bird and seventy-six hand colored engravings. Because he was working on a limited budget, he squeezed several species into each plate, juxtaposing them in different poses and filling the working area right up to the edges of the plate. Although Wilson drew the birds himself, the actual engravings were produced by John Warnicke and Alexander Lawson. Wilson traveled extensively in search of his birds and died as a result of an exhausting excursion in 1813, prior to the completion of the final volume. His friend, George Ord, posthumously published the eighth volume in 1814 and also edited the final ninth volume, to which he added a biography of Wilson's life.